Neopets Premium is the paid membership of Neopets. If you pay for Premium membership, you will be able to get extra features on the site. These features are designed to provide a more convenient gameplay and other exciting perks. This page is designed to give you an overview of those features and perks so you can make an informed decision of whether or not this service would be worth paying for to you. Not only does premium membership come with the aforementioned perks, but there is also a premium notification bar that will both enhance regular aspects of game play and provide even more perks for premium members. According to the Help page, the notification bar will also notify you of beta tests and any pertinent information. The toolbar appears at the bottom of each screen as you roam around Neopia. You can turn the notification bar off at Site Preferences. Below are descriptions of what each of these links provide. The premium Super Shop Wizard (also known as SSW) is commonly regarded as the single most useful and most exciting perk of premium membership by premium members. Much like the traditional Shop Wizard, the Super Shop Wizard will search the shops and galleries of other Neopians to locate specific items, as shown below. However, the Super Shop Wizard (SSW) goes far above and beyond just that. Upon searching, the Super Shop Wizard returns only the ten lowest prices from all of the shops in which that item can be located. Refreshing to find cheaper prices is no longer needed. Although the SSW is a wildly convenient tool for premium users, there are a few limitations to the SSW's power. It takes a lot of work to be the Super Shop Wizard - he often gets tired. After a certain amount of searches, the SSW will tire out. When the SSW is too tired for any more searches, he will require a certain amount of time before he is ready to search again. The number of searches you are allowed with the SSW is a factor of the hour in which the searches occurred. Essentially, the shop wizard can only search for so many things each hour; if you tire him out, you'll have to wait until the next hour to continue searching. 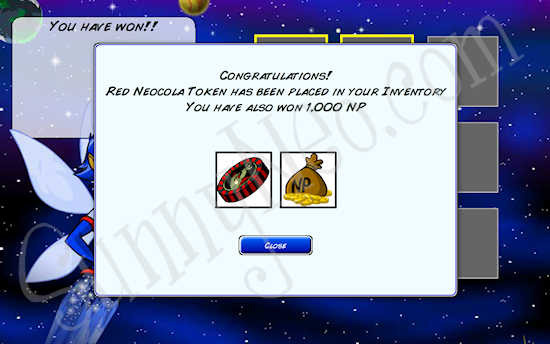 This is different than the message you'll receive if there simply happen to be no items under 99,999 NP in any shops around Neopia; there may still be some of the item in other users' shops, but you will have to use the regular Shop Wizard to search for them. The Super Shop Wizard can also locate the average price of the ten lowest prices containing the item in question. By checking the box marked "Price Only" will generate a response like the one below, showing the average price of the item. While you're not allowed to search for the items listed above like paint brushes and nerkmids, you may still do an average price search on them. This could be useful if you're looking to price a nerkmid in your shop. Even with all of the restrictions, the SSW is highly useful. Premium users value this tool immensely (and for good reason)! Premium users also receive an extra featured game each day (in addition to the featured game that all players get), as shown below. This game acts exactly like the featured game for all players. Therefore, instead of getting double neopoints on one game each day, premium members get two games on which to try their luck! The next link on the Premium Notification Bar is a quicklink to a section for dailies shortcuts, as shown below. The wonderful thing about this section is that it is 100% customisable. By clicking the padlock outlined in orange above, you can rearrange the order in which the dailies are displayed. Additionally, outlined in blue, there is a cogwheel link that will take you to a page to manage which dailies you would like to appear on the quicklink. On this page, you can check which dailies to display from links for nearly every daily that Neopets offers. However, if some of the dailies you would like to display aren't found on this page (or any links you'd like to display, for that matter! ), there is also an option at the bottom of the page to create custom daily links. The next section on the Premium Notification Bar is called the bankroll. The bankroll is designed to make managing all aspects of making neopoints much easier and more convenient. On the bankroll, you can see your bank balance, shop till, total neopoints, and stock values. Bank balance: displays the amount of neopoints that can be found in your bank account; however, you'll also notice a little green checkmark. That checkmark is your way of knowing whether or not you've collected your daily interest each day; the checkmark will only appear after interest has been collected. Shop till: displays any neopoints that are sitting in your shop till. Total neopoints: displays just that - your total neopoint value, including bank account, shop till, and any neopoints you might have on hand. Stock totals: quickly displays an overview of all stock market information, including how many stocks you possess, how much you paid for them, how much they're worth at the moment, and the overall percent change in the value of the stocks. Overall, the bankroll makes generating neopoints and managing them significantly easier instead of having to check multiple links (just as it's designed to do)! Premium members are also allowed to own a fifth neopet on their main account, rather than the usual maximum of four. If you have a grey Scorchio appear on your Premium Notification Bar, that means you have not yet created the available 5 pets. As soon as you create a 5th pet, this icon will disappear off the toolbar. 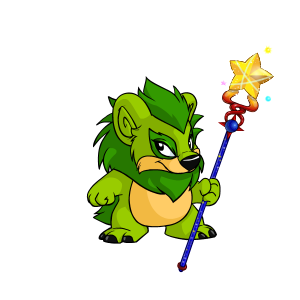 This fifth neopet will appear on your userlookup, and you will be able to interact with this pet the same as all your other neopets. Additionally, you can transfer or adopt this pet just as you can with all your others. You do not have to take advantage of this fifth pet slot, but it is a perk to know you have the option. If you have a fifth pet and choose to terminate your premium membership, you will not be able to keep your fifth neopet when your membership expires. At that time, you will be prompted to either transfer or abandon one of your neopets. It does not have to be the pet in the fifth pet slot; instead, you will be able to choose which pet to transfer or abandon. If you choose to abandon a pet, that pet will be held for 90 days before being released in the general Neopian Pound. In the event that you renew your premium membership within those 90 days, you will have the option of getting your fifth pet back. However, if the pet remains on hold for more than 90 days, it will then be released into the pound for other Neopians to adopt. On the right-hand side of the Premium Notification Bar, the first link will lead premium members to their Space Faerie Scratchcard Kiosk. This kiosk is a special scratchcard kiosk that is only accessible by premium members. Every Friday, the Space Faerie will award premium members with a special scratchcard, free of charge - how generous of her! Premium members can scratch this scratchcard to try and match three spaces; luckily for premium members, every scratchcard is a winner! When you scratch a winning scratchcard, you'll be prompted to accept your prize. 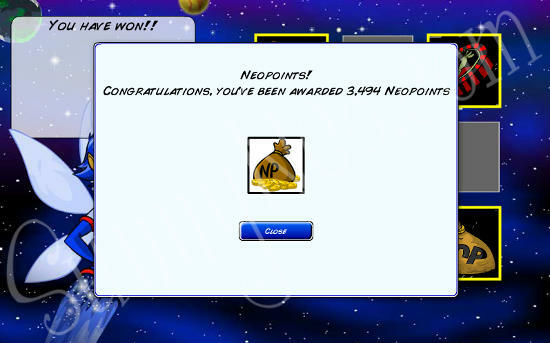 You win an amount of neopoints between 2,000 and 5,000. Jackpot! You win the jackpot which can go into the millions, this is very rare though. You win a Mysterious Token. You can play these at the Space Faerie Vending Machine. You can't sell, trade or donate these coins, you can only play them. If you play one of the tokens you can win codestones, dubloons and faeries. Once you scratch your scratchcard, the Space Faerie will let you know that you no longer have any scratchcards left to scratch, as shown below. However, do not be alarmed if you forget to scratch your scratchcards each week; any scratchcards you have will remain at the kiosk until you return to scratch them. To see if you have additional scratchcards waiting, you'll just have to scratch each one and wait until the screen above (letting you know you're all out of cards) appears. Note: An interesting discovery since the release of the new scratchcards is that these cards will actually act as phantom items in your inventory. For example, if you have five items in your inventory, but you have 3 unscratched space faerie scratchcards, your inventory will tell you that you have 8 total items in your inventory. In order to remove the "phantom items," all you have to do is scratch your unused scratchcards! From the Skirmish Battles you can win special boons, some are premium boons. One of them is called Full Pockets, it affects the outcome of your premium scratchcards. You will win extra neopoints when you win neopoints. 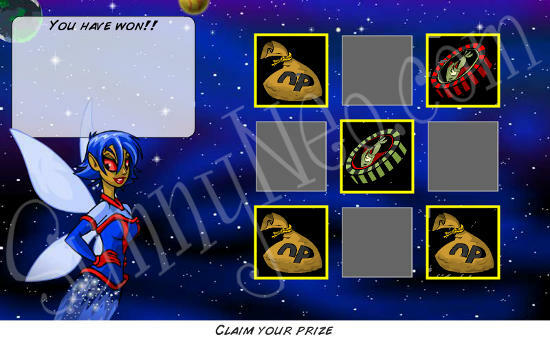 You will also win neopoints when you're getting an item prize, while normally you don't. Another interesting feature of premium membership is the awarding of Premium Collectable Cards for each month of premium membership. By clicking on the collectable cards icon, you are brought to your premium cards. Another way of doing so is through your userlookup. There your Neodeck will day + Premium Cards. Other users can also admire your premium cards there. These cards are automatically placed in a special Neodeck and they are only ever awarded to premium members for each month of membership; if you take a break from premium membership and then return, all of your previous cards will reappear, as well as any new cards. However, you will not see any cards from the periods during which your membership was expired. For more information on collectible cards, please feel free to view our complete Collectable Card Guide! The next quicklink on the Premium Notification Bar will direct you to another of the well-loved aspects of premium membership - the Premium Neoboards. The Premium Neoboards are neoboards that are accessible only by premium users, as shown below. You'll notice that there are multiple boards to access - Help, Main Hall, and Spotlights and Games, as well as Charter Boards (including Main, NC Mall, Trading/Auctions). You might be wondering what the importance of Charter Boards are; although all Premium Neoboards are reserved for premium members, the Charter Boards are further reserved for only those premium members who have had premium for 4 months or longer. Premium users enjoy the Premium Neoboards because they are generally much more relaxed and contain less spam. Often on the premium neoboards, you'll find helpful topics such as Random Acts of Kindness, Wonderclaw Item Exchanges, Free Lending, etc. The last link on the Premium Toolbar will link to the Premium FAQ of the Neopets help section. Although this is helpful, the real perk to premium membership is the overall improved support. If premium users experience a bug or glitch or get silenced for whatever reason, their tickets are addressed much more quickly than those of regular users. If you've ever submitted a ticket to Neopets support, you'll know how exciting this feature is.